o Thru March 15: Katherine E. Nash Gallery, Minneapolis, MN. 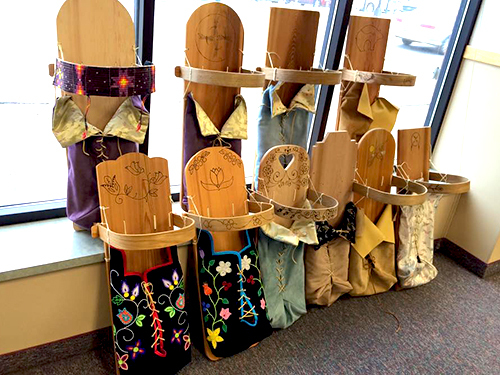 o April 1-May 18: Mille Lacs Indian Museum, Onamia, MN. o May 28-June 30: Tweed Museum, Duluth, MN. o March 23-April 22: School District 196 Native American Parent Advisory Committee, Rosemount. o May 1-30: Fort Snelling, St Paul. Taking its title from Native writer, director and producer Georgina Lightning’s 2008 contemporary drama shot in Cloquet, Minnesota, Older Than America highlights the work of two emerging Native visual artists: Carolyn Lee Anderson and Bobby Wilson. On view through April, the exhibit will also feature a community screening of Lighning’s haunting thriller. On view through April at The Center for Changing Lives, 2400 Park Avenue, Minneapolis. 612-879-5335 or www.lssmn.org/cfcl. Free and open to the public. Call for artists for Visions and Viewpoints, Artists of the Dakota and Ojibwe People Gallery show: May 5 – June 24. Open to all professional and emerging artists who are 18 years of age or older and are members of either the Dakota or Ojibwe tribes. Ten artists from a variety of art media will be selected. Each artist will receive a $500 stipend plus up to $200 mileage for participating. Selected artwork should include/invoke some aspect of cultural relevance. Submission deadline April 1. PDF images may be emailed to: info@rwarts.org. Artists are asked to attend the reception. For info, see the website: www.redwingartsassociation.org. oApril 3 and 17: Bloomington Clinic, Bloomington Division of Health, 1900 W. Old Shakopee Road, 3 – 5:30 pm. o April 24: Brooklyn Center Clinic, Hennepin County’s Brookdale Service Center, 6125 Shingle Creek Road, 9 to 11 am. o April 6: Downtown Minneapolis Clinic, Hennepin Health Services Building, 525 Portland Ave., Minneapolis. 8:30 to 11 am. Are you Native American? Do you need a Mammogram or Pap Smear? We Can Help! We will Provide: A Great Lunch; Incentives for Getting your Mammogram/Pap Smear; Educational Speakers; and Bingo for Prizes. Call Diane Archambault at 612-721-9881 to schedule your mammogram or pap smear. 9:00 am.-4:00 pm. At the Indian Health Board, 1315 E 24th St, Minneapolis. A live art performance by nationally recognized Native American artist Bunky Echo-Hawk. Free! From 6 pm to 9 pm at the CSU Ballroom, MSU-Mankato, Mankato, MN. The 7th Generation Ogichidaakwe/ Akicita Winyan host Gathering of Sacred Voices will be held at MIGIZI Communications, 3123 East Lake Street, Minneapolis. The purpose of the event is to empower, educate and mobilize Native youth to promote a healthy community. Youth will learn and utilize leadership skills and develop action steps focused on social change and positive cultural practices. Native Youth Futures, In the Footsteps of Our Grandmothers and New Media Pathways will facilitate circles in the following areas: Spoken Word, Media, Entrepreneurship, Culture, and Youth Leadership Development. We ask agencies that work with youth to bring in students for the all day workshop and gathering. We do have bus tokens we can give them for return trip. Lunch & Door Prizes.10:30 am -4:30 pm. For more info, call 612- 721-6631. Native American Home Crafters, buyers wanted! Stop and shop for unique and handcrafted items made by local Native American home crafters! We are located next to the Franklin Library. The craft sale will be in the front community room right off Franklin Avenue. Vendors: space is limited, first come first served.10:00 am to 4:00 pm. Minnesota Chippewa Tribe Bldg., Front Street Meeting Room, 1308 E. Franklin Avenue, Minneapolis. FMI: Contact Carl at 872-8388 or Marcy at 612-872-4636. Donate for life, love, & hope… The Minnesota Chippewa tribe Building Programs will also offer a luncheon. The donations received will go to the American Indian Cancer Foundation Hope for Life campaign. Please join us for the luncheon and donate whatever you can for this important effort. 11:30 am to 1:00 pm. Entrance at the rear of the bldg. Minnesota Chippewa tribe Building, 1308 East Franklin Avenue, Minneapolis. For info, call 612-872-8388. Actor and musician Gary Farmer, member of the Cayuga Nation in Canada, will be on the University of Wisconsin-Superior campus from 2:30 pm – 3:45 pm. Farmer will present on the Haudensaunee culture and perspective, and indigenous cinema. Gary Farmer has appeared in over 100 films and television shows. Free and open to the public. Gary Farmer and the Troublemakers, (Gary’s blues band) will perform at UW-Superior’s Yellowjacket Union Shippar Atrium at 7:00 pm Concert is free and open to the public. The First Annual Sexual Assault Awareness Conference, a two and a half day event, will be held at Seven Clans Casino and Events Center at Red Lake. The conference is being sponsored by Equay Wiigamig (Women’s Shelter) of Red Lake. The theme of the conference is "Ganawenindizon da-gina’amaagemagak maji-doodawind bemaadizid" (Protect your spirit, stand against sexual violence.) Invited speakers include Vednita Carter and Joy Friedman of Breaking Free, and Robin Charboneau. The conference is free to all, both on and off reservation, who work with or are interested in this important subject matter. To register or for more info, call Equay Wiigamig – Red Lake Women’s Shelter at 218-679-2500 or 888-679-2501. In order to help address the shortage of Native American male mentors, the Native American Mentoring Initiative Advisory Council and Big Brothers Big Sisters are hosting the NAMI Mentoring Open House. Adults will have the opportunity to learn more about what it takes to mentor a young person and the resources available. 6:00-7:30 p.m., Division of Indian Work, 1001 East Lake Street, Minneapolis. Space is limited, so please register early. Email: MTaylor@bigstwincities.org or call 651-485-0175. The Minnesota Indian Women’s Resource Center’s Spring Feast will be held starting at 11:00 am until food is gone. Free. MIWRC, 2300 – 15th Avenue South, Minneapolis. For more info, call 612-728-2000. Feast and fair at 5 pm, Grand Entry at 6 pm. For further info, please call 651-793-3803. Sponsored by MOFAS. Harding High School, 1540 E. 6th St., St. Paul. A music event with the intent to create public awareness of the global destruction of the earth. With the currentproposed Keystone XL Tar Sands Pipeline, Wisconsin Iron Mining, global warming, depletion of our natural resources, sacred site desecration and the loss of species at an alarming rate…we need to intensify and direct more attention to this plight with the support of concerned humans. Contemporary Indigenous musicians, Indigenous elders and environmental activists including Gary Farmer, Bluedog, Highway 49 Blues Band, Chicago comedian Josie Dykas, and others. 2 pm at the Mpls American Indian Center, 1530 E Franklin?Ave., Mpls. Professor Colette Hyman, author of the new book "Dakota Women’s Work: Creativity, Culture and Exile," will talk about how Dakota women continued the traditions of their people, even in the face of exile and attempts at extermination. "Dakota Women’s Work" (MHS Press 2012) examines how the decorative work of Dakota women and the changes in that work embodies the culture, spirit, and history of the Dakota people. 7 pm. Free Minnesota History Center, 345 Kellogg Blvd W., St. Paul. Call 651-259-3000, 800-657-3773‚ or see: www.minnesotahistorycenter.org. Share your ideas about Indian Education in Minneapolis! Receive info about the agreement with MPS School Board (MOA). Find out what Indian Education has been up to this year! Meet Indian Education Parent Committee. 5:30 to 7:30 pm. 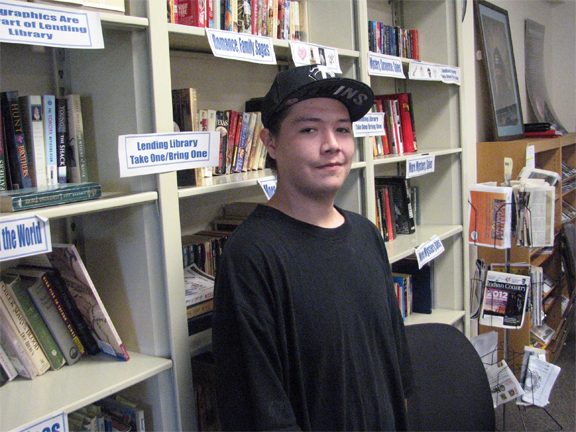 Anishinabe Academy’s Middle School Media Center. For more info, contact Deanna StandingCloud, Parent Engagement Coordinator for MPS Indian Education at 612-668-0612 or: deanna.standingcloud@ mpls.k12.mn.us. Food, games, prizes and fun! For past and present DIW clients who are expecting or who have delivered in the last year. Presented by Women of Traditional Birthing, a program of the Division of Indian Work. Noon – 3 p.m. Dakotah Lodge, Division of Indian Work, 1001 East Lake Street, Minneapolis. For more info and to R.S.V.P., contact Fawn Edberg at 612-279-6312 or fedberg@diw-mn.org. North Hennepin Community College will celebrate its third annual Earth Week with events and speakers to educate the campus and wider community about "Indigenous Peoples and the Land", this year’s theme which honors the sesquicentennial of the 1862 US-Dakota war. Some of the events include: Why Treaties Matter, Self-Government in the Dakota and Ojibwe Nations A Traveling Exhibit; Mni Sota: Telling the Land from a Dakota Perspective. Ramona Kitto Stately weaves a personal story of the exile of her family from Minnesota while exploring the importance of land from a Dakota perspective; Earth Week Opening & Welcome – President John O’Brien, Annamarie Hill Kleinhans, Executive Director of the Minnesota Indian Affairs Council and other; Diane Wilson – A Reading. Wilson is a creative nonfiction writer. Her essays and memoir use personal experience to illustrate broader social and historical context; Dr Anton Treuer: Indigenous Language, Culture and the Land: – Making the Connection. Treuer will discuss the interconnections between indigenous languages, culture and the land, with a focus on the Indigenous Peoples of Minnesota; Terry Janis – Why Treaties Matter. Janis, of the Indian Land Tenure Foundation, will explore the fundamental relationship between American Indian nations, the US government and state governments; Chase Manhattan – Live performance from NAMMY winning Minneapolis Native Hip Hop Rap artist; The Politics of Wild Rice – An American Indian Perspective; Osseo 17th Annual Wacipi and Indian Education Day; and many other events. To find out dates, times and locations see their website at: www.nhcc.edu/earthweek or call Ana Davis at 763-424-0961 or Don Wendel at 763-488-0265. The Minnesota Indian Women’s Sexual Assault Coalition’s annual conference: 6th Annual Restoring the Sacred Trails of Our Grandmothers: Strengthening Our Circle to End Sexual Violence. Evening Activities, Traditional Pow-wow, Honoring survivors. Who should attend: Advocates, Law enforcement, Medical professionals, Chemical dependency programs, Mental health providers, Community members, elders, and others working on ending violence against American Indian and Alaska Native women and children. Held at the Crowne Plaza Hotel and Suites, Three Appletree Square Bloomington, MN. For more info, call Cristine Davidson at 651-646-4800 or see:www.miwsac.org. The Minnesota Tribal Summit on HIV/AIDS and Sexually Transmitted Diseases will b­e held at the Shooting Star Casino on the White Earth Reservation, MN. Tribal Leaders and Health Providers – what you need to know about HIV/AIDS in Indian Country; Preventing HIV/AIDS: Testing, Counseling and Referral to Treatment; Resources available for treatment, and more. Hosted by MN Department of Human Services’ HH Program. Keynote: Ending the AIDS epidemic in Indian Country: The Promise and Challenges Ahead (Dr. Tony Stately). Contact Denise at: Denisek@indigenouspeoplestf.org by April 19 to register for the Tribal Summit. The Indigenous Peoples Task Force presents the 2nd Annual Native C.H.A.T. Film Festival. The Native C.H.A.T. Film Festival is a one day event where films created by Native youth will be screened. The submitted films will be an opportunity for Native youth to share their perspectives on these important issues: HIV/AIDS; Alcohol, Tobacco, & Other Drugs (ATOD); Phobia’s & Ism’s (racism, sexism, coloinalism, homophobia, bullying, etc.). MC: Chase Manhattan. 1 pm – 8 pm. The Film Festival will be a tool of social justice broadcasting the voices and visions of Indian Country’s future. The Film Festival is free and open to the public. At the Shooting Star Casino, 777 Casino Road, White Earth Reservation. New event will honor cancer survivors, raise awareness of cancer risks, and increase resources to ease the burdens of cancer. The Powwow is a celebratory way to help fight one of the most debilitating diseases Minnesota American Indian families encounter. For Powwow participants, there will be a feast but there will not be cash supports for the day. Individuals and groups are being recruited to form teams to fundraise before and during the event. If you would like more information about forming a team contact Julia 612-584-0428 or email powwow@AICAF.org. All teams will have the opportunity to have a booth at the event to raise money by selling food, crafts, and/or activities. For info see: www.AICAF.org. Held at the Midtown YWCA in Mpls from 10 am-10 pm. Hosted by the American Indian Cancer Foundation. Learn the art of making a coil sweetgrass basket in this two-day workshop. Sweetgrass is a fragrant sacred herb used in ceremonies and artwork by the Ojibwe. Children under age 18 must be accompanied by an adult. Refreshments and a light lunch provided on both days. Reservations and prepayment required by April 25. Discount hotel rooms are available at Grand Casino Mille Lacs on Saturday night for all workshop participants. A minimum of five participants is required to host the workshop. Time: Noon to 4 pm on Saturday. 10 am to 2 pm on Sunday. Cost: $60, $55 for MHS members; $15 supply fee. Reservations required, call 320-532-3632. The Holland & Knight Charitable Foundation welcomes entries for the Young Native Writers Essay Contest, which it organizes each year in partnership with the Smithsonian Institution’s National Museum of the American Indian. Winners of the annual contest will receive college scholarships and an opportunity to participate in a Scholars Week in Washington, D.C. Deadline is April 30. This contest is for high school students. Essays should address the following: crucial issue confronting your tribal community today and you hope to help your tribal community respond to this challenge and improve its future. The contest is open to Native American high school students currently enrolled in grades 9-12 only. All students participating in the contest should have a significant and current relationship with a Native American tribal community. Five first-place winners will each receive an all-expense-paid trip to Washington, D.C., the week of July 8-14, 2012, to visit the National Museum of the American Indian and other prominent sites. They will be accompanied by the teachers who inspired their entries into the contest. The winners also will receive a scholarship of $2,500 each. To learn more on how to apply, see: www.nativewriters.hklaw.com. Come celebrate community and the start of MN American Indian Month at the Parade of Nations and Celebration, beginning at 9:30 am at Cedar Field, Little Earth of United Tribes, Minneapolis, MN. Join in the Parade of Nations and show your pride wearing regalia, ribbon shirts and shawls. Organizations and groups are encouraged to carry banners, puppets, etc. All organizations/groups/eagle staff carriers/ honor guards interested in participating or creating a float for the parade, contact Daniel Yang at 612-235-4969 or: dyang@nacdi.org. No registration fees. The 17th Annual American Indian Wellness Fair, in partnership with the MN American Indian Month Kickoff, will be held from 11:00 am – 3:00 pm at the Minneapolis American Indian Center in Minneapolis. Registration materials for assessment tables, contact Tish Rivera – Cree at 612-721-9839 or see: trcree@IHB-MPLS.org. The Minneapolis American Indian Center will be holding their annual Open House from 12:00 – 2:00 pm. Stop by to meet the staff and learn more about the programs offered within the center. Lunch will be served at 12:00 pm. MAIC, 1530 Franklin Avenue East, Minneapolis. For info, call 12-879-1795 or see: www.maicnet.org. Minnesota State Arts Board Folk and Traditional Arts Grant deadline. Folk and Traditional Arts supports the artistic traditions and customs practiced within community and/or cultural groups by identifying, documenting, preserving, presenting, and honoring Minnesota’s folk arts and traditions. Project may be a single event or activity, or a series or combination of multiple events or activities. May include field research and documentation of folk and traditional art forms. May include passing on folk and traditional arts through mentorships or apprenticeships. Projects must have a public component such as a concert, exhibition, documentary, workshop, work in the classroom, or other activity that engages members of the public in the work of Minnesota’s folk and traditional artists. Any Minnesota folk or traditional artist; Any Minnesota arts producing organization that is exempt from taxation under section 501(c)(3); Any Minnesota public agency such as a unit of local, state, or tribal government. Grant range $5,000-$75,000. Applications are available at: www.arts.state.mn.us. Applications must be received by May 11 by 4:30 pm. Information can also be found on the community liaison Facebook page, MN-State-Arts-Board-Community-Liaisons. Native community members with questions about the grant can call the MSAB office at (800) 866-2787 or contact the Native American Community Liaison: rhiana.yazzie@arts.state.mn.us. Employers & Job Training Programs will be in attendance. American Indian OIC Programs. Join us for lunch and a tour! Noon to 3:00 pm. Tours at -12:30 pm & 1:00 pm. American Indian OIC, 1845 East Franklin Ave Minneapolis. For info call 612-341-3358. Minnesota State Arts Board Artist Initiative grant for Performance, Arts, Dance, and Theatre deadline. Applications are available at: http://www.arts.state.mn.us. Native community members with questions about the grant can call the MSAB office at (800) 866-2787 or they can email the Native American Community Liaison at : rhiana.yazzie@arts.state.mn.us. Applications must be received by 4:30 pm. Information can also be found on the community liaison Facebook page, MN-State-Arts-Board-Community-Liaisons. The ICWA Law Center will be holding our Annual Spring Feast on May 30, 2012. The ICWA Law Center welcomes all community members to join us for a luncheon celebration! 11:30-1:30. ICWA?Law Center, 1730 Clifton Place, Suite 104, Minneapolis, MN . For more info, call Tammy Esposito at 612 879 9165.